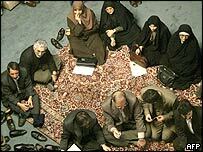 Khatami dismissed the row as "part of the electoral process". Iran's President Mohammad Khatami says he is confident that upcoming elections will be "free and competitive". Speaking at the World Economic Forum in Davos, Switzerland, he played down the political stand-off, saying it was a "normal part of the elections process". Earlier, Vice President Mohammad Ali Abtahi reiterated a threat from senior officials last week that the entire reformist government was ready to quit. MPs were enraged by a conservative ban on certain electoral candidates. "My colleagues and I have chosen one goal, to make sure that there is a free and competitive election," Mr Khatami said. "And the course of the events is going, hopefully through the grace of God, towards such a free and competitive election." Speaking after making a keynote speech that drew heavy applause, Mr Khatami also said a lack of respect for Iran's Islamic government prevented fruitful talks with the US. Earlier, Vice President Mohammad Ali Abtahi said after a weekly cabinet meeting on Wednesday that President Khatami and the entire reformist government would quit if further cases were not reviewed. It follows a Guardian Council decision to ban over 3,500 reformist candidates. The conservative group reversed its decision on 200 candidates on Tuesday, following a call for a review by the Supreme Leader Ayatollah Ali Khamenei. "It is supposed that all of us will go together," said Mr Abtahi. "A number of cabinet ministers and a number of vice-presidents have already resigned. Naturally, they are waiting to see how things go," he added. He later clarified his remarks to say it was a repeat of threats made by senior officials last week, and previous comments from the president himself calling for reformists to stick together. The BBC's Miranda Eeles in Tehran says many believe this is the latest in a series of bluffs, threats and counter-bluffs by reformists to try and put pressure on the conservatives. 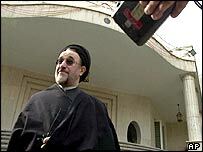 Earlier, Mr Khatami told Swiss TV station SF DRS that he had no intention to quit. "I have the intention to continue my task and my service to the people," he said. The Guardian Council has until the end of the month to complete its task of reviewing the disqualifications of almost half of the 8,200 election hopefuls.